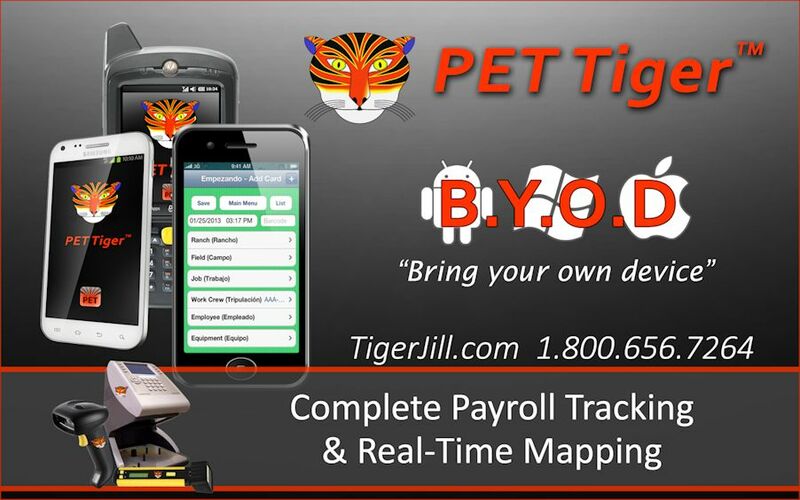 Payroll Employee Tracking (PET) Tiger is a paperless and wireless labor management tool that incorporates different technologies such as time clocks, biometrics and handheld devices. Via its comprehensive data collection methodology and database structure, employers gain control and better performance through analysis of their operations. It is compatible for use with virtually any electronic device, including Android, Apple and Windows products. Nor is it dependent on one specific operating system or service provider. extends data collection and processing capabilities to a new level of ease and friendliness. Simplicity and flexibility are the key forces behind our Tracking system. 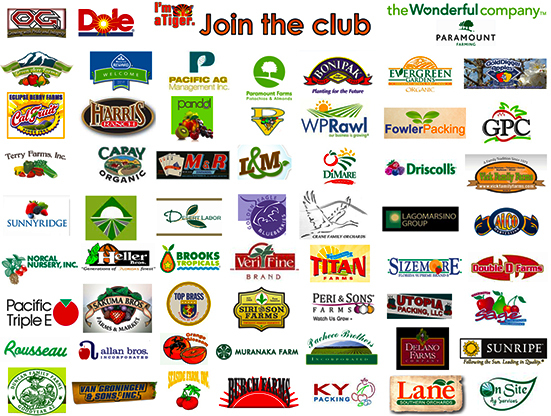 Just issue your employee's their own bar coded or RFID badges. Streamline paydays, track employees and experience the many other benefits that bar code and RFID technology can bring to your business. Employee tracking system can also provide you the means of capturing data about your work flow, labor allocation, job costing, inventory utilization, harvest information and many other facets of your business. This systems' true strength lies in how straightforward collecting the scan data is. Field personnel learn the scanning procedures easily and are therefore much more receptive and willing to incorporate the system into their daily routines. Enter your data via an electronic scanning device, by means of the barcode or a RFID tag. The system handles piece and hourly rates, or a combination of the two. You can even track the number of piece units accumulated but pay only hourly! Scan in an entire crew at once; enter other Employees as individuals. Defaults are maintained to minimize the number of scans necessary. Thanks to advances in technology, labor management is no longer about maintaining manual records of hourly wages or piece work data. Gone are the days of being lost in paperwork, tending to handwritten time sheets and payroll calculations. 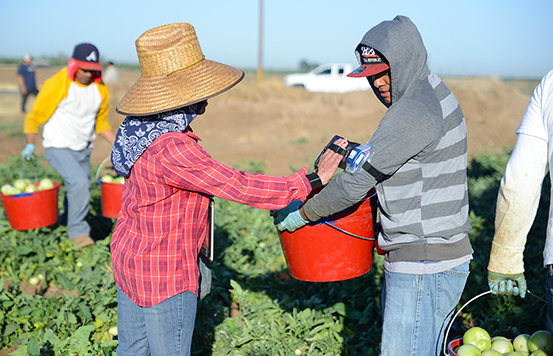 Today, agricultural operations are electronically monitoring labor data to make efficient management decisions and improve overall productivity. What are the benefits of using PET Tiger™? What type of support do I get with Orange Enterprises? Orange Enterprises, Inc. can assist in training. 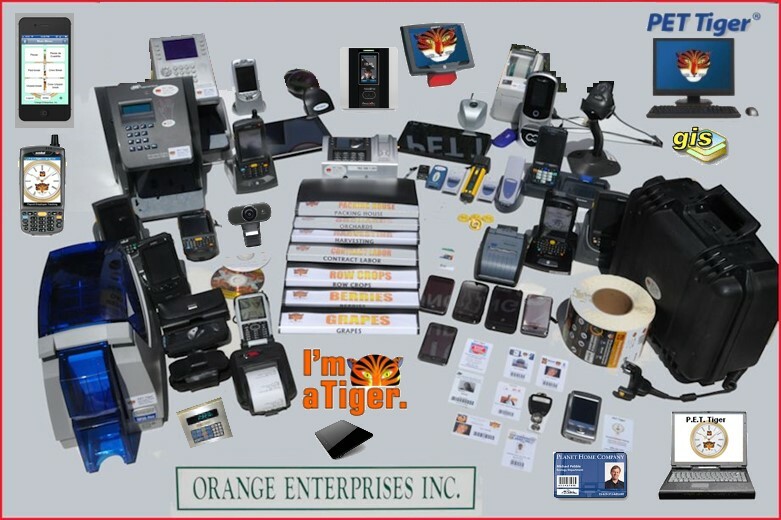 Our training courses, whether in our office, regional location or on-site, Orange Enterprises, Inc. provides comprehensive and intensive training, helping you to realize the greatest return on your investment. The actual developers of the software provide instruction as well as software modification to fit your unique needs. We are experts who empower our customers to effectively manage their workforce. 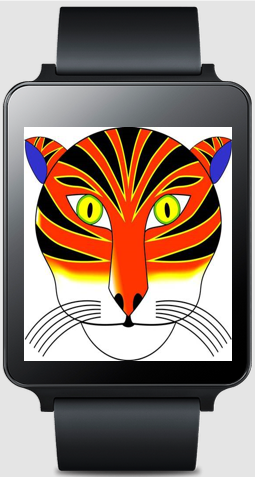 P.E.T Tigers enables you to reduce costs, increase productivity and accuracy, improve employee satisfaction, and ultimately enhance your bottom line. 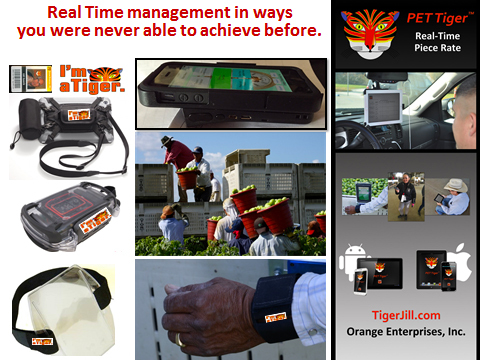 PET Tiger is revolutionizing the Ag Industry. 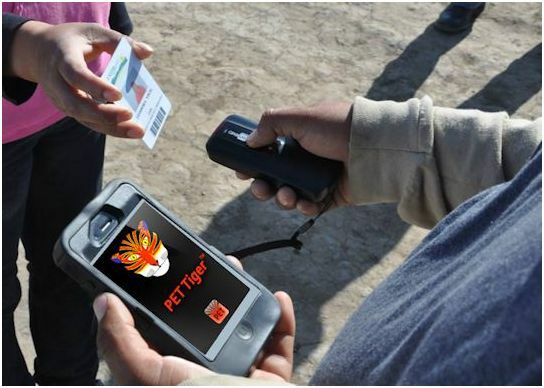 Compatible with a wide range of wireless devices including Android, Apple, and Windows, PET Tiger can collect data from virtually any type of device including a variety of biometrics. This allows it to provide innovative payroll solutions and real-time data collection, tracking, and monitoring. 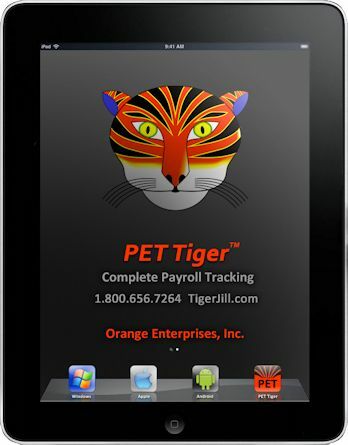 With PET Tiger, managers can track productivity down to the field and individual worker. Ruggedized Bluetooth or RFID scanners with smart devices measure worker productivity and transmits it back to the main office. 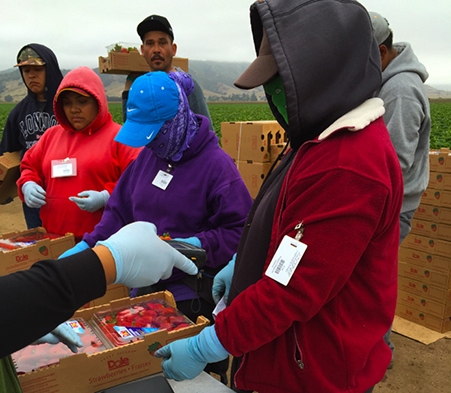 Allowing for multiple states and accounting systems all within a single database, this all-inclusive system, collects data from all areas of the operation such as the fields, packing houses, greenhouses, coolers, and offices. PET Tiger can also keep you in compliance with worker rights regulations. Recording and monitoring break time, ensuring compliance with minimum wage laws are simplified with the system. Only when you measure piece-rate you can actually manage your labor force. By creating efficiency guidelines you can transform your management in ways you never realized before. By collecting piece-rate data in real time you can radically change your employees performance as well as your bottom line. 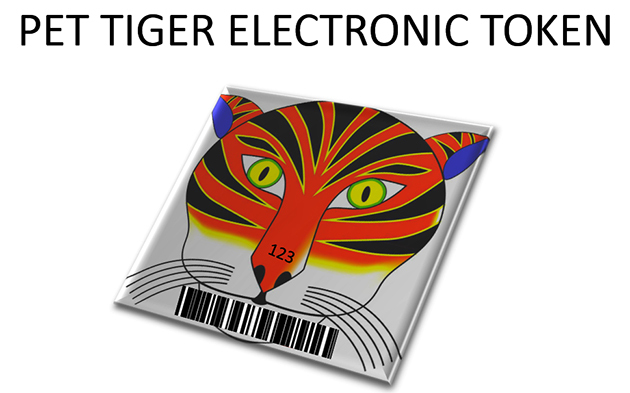 Since PET Tiger is a modular system it allows users to purchase only the parts relevant to their needs. Providing its users another tool to tailor the system to their policies as well as government regulations. The Training Module can record employee training including safety and breaks, as required by law. This allows for easy employer verification and expedites the process to provide reports for OSHA auditors as well as generating training certificates for employees. The Bonus Module calculates bonus pay based on employee performance, additional hours for specific jobs, as well as Fair Food Premiums. PET Tiger data mapping provides an interactive visual display of the status of a companys labor force and the equipment in use. With this tool managers can make informed decisions wherever they are. Contract labor data can easily be incorporated as well using the Time Sheet Data Entry module. 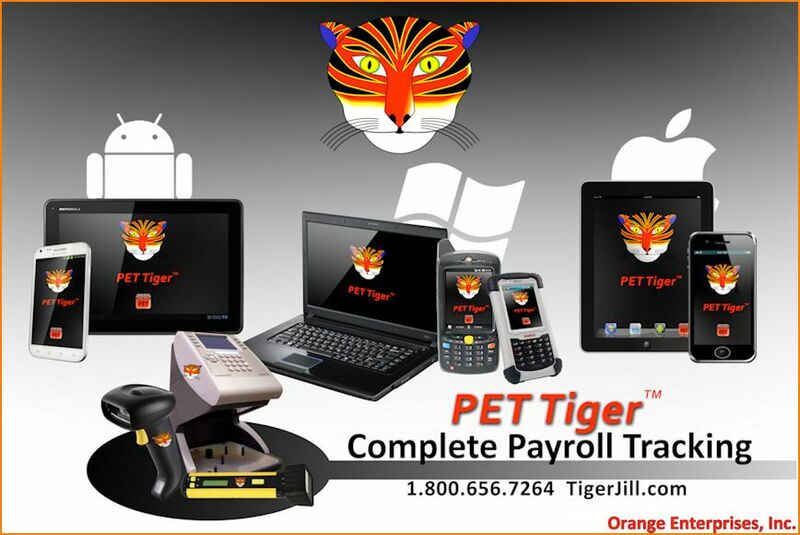 The PET Tiger Billing Module provides the ability to create customers invoices each time they generate payroll, ensuring all billable time is included. 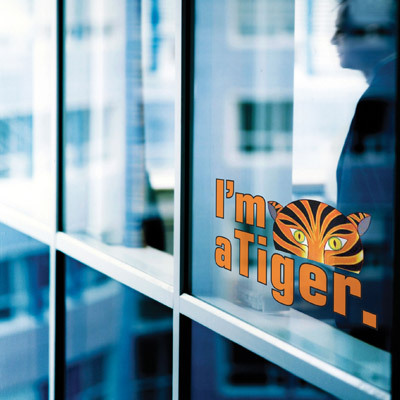 Orange Enterprises continues to work closely with its individual clients to refine the PET Tiger from purchase to implementation. With todays escalating labor prices, intense regulations, as well as, the scarce accessibility to a trained labor force, an effective management tool is crucial. 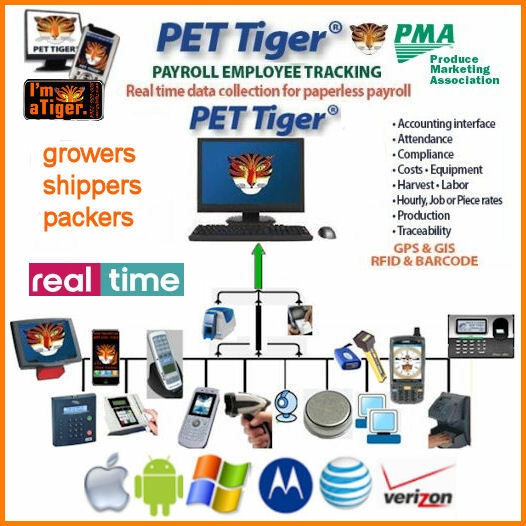 PET Tiger utilizes the latest technological innovations to optimize and manage the return from your employed labor crews. Via PET Tigers scalability to your operations size and unique needs, we will tailor for you the best possible software and hardware configuration. Scanners, Smart devices, GPS, RFID, Biometrics, Software Modules and options will be assembled to maximize the efficiency of your operation. Copyright © 2019 Orange Enterprises Inc. All Rights Reserved.